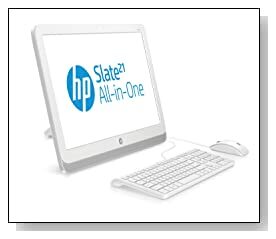 HP Slate 21-K100 is a touchscreen All-in-One desktop that is designed to be a nice web browsing, video watching, song playing, word processing and other simple daily tasks computer with a large high resolution screen and decent audio at a low price. More importantly you don't have to deal with any of those security threats targeting Windows systems. HP Slate 21.5 inch screen desktop weighs a bit more than 10 lbs (10.7) with dimensions of 13.92 x 2.63 x 20.90 inches so although the operating system is Android, this is definitely nothing like a tablet and you can't use it without plugging it to a power source as it doesn't have an integrated battery- this is a proper budget desktop with an unusual operating system that is rarely seen on other PCs: Android 4.2.2 Jelly Bean. It comes with an Nvidia Tegra 4 ARM processor at 1.66 GHz, 1GB of system RAM, and 8GB of eMMC flash storage- with the lower memory and storage space, pretty much similar specs to an Android tablet. You also get free Box subscription, which is a cloud based. But despite this seemingly low specs, it performs well in tasks that it is created for. HP Slate 21-k100 is a good system in terms of hardware, a great full HD 1920 x 1080 pixel resolution screen with IPS technology (178 degree viewing angles without distortion or color shifts) to watch videos and play light games on, plus the stereo speakers enhanced with DTS Sound+ system for great sound for listening to songs- nothing like the tinny Android tablet speakers. It is a low cost internet, video and audio machine with corresponding features but not large amounts of system memory or hard drive. It is something between an All-in-One PC and an Android tablet but neither in a way and actually unique in that sense. You'll find 11 shortcuts (that can also be easily customized) to some of the most commonly used applications along with a Google apps folder, such as Google Chrome, Google Play, Gmail, Gallery and Webcam. You'll find both Google apps and Hp's own apps to use on HP'S high resolution screen. It supports the SD-card storage and USB expansion and HP File Manager creates a simple to use panel to edit, manipulate and move files on USB and SD-cards and on your system. (It has a full-size SD card slot and 3 x USB 2.0 ports). 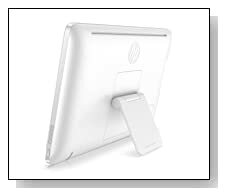 HP Slate 21-k100 not being a Windows device, you won't get Microsoft Office programs but you have the Kingsoft Office that allows you to edit Word, Excel and PowerPoint documents. The Tegra 4 processor is really fast, Full HD screen quality is divine along with the superior DTS+ sound, boots up very fast, runs quietly and remember the most important thing, no Windows troubles with bugs. Sure you may have problem with running certain apps and you only have 8GB of storage and it would have been nicer to have wireless keyboard and mouse but the price is alreay fair for the screen, design, sound and processor speed.